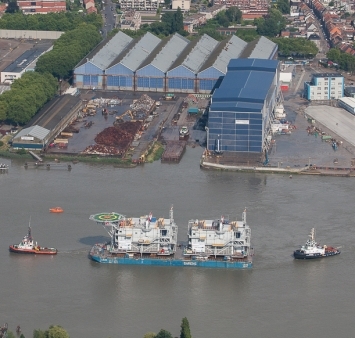 Hoboken, Belgium, August 17, 2015 - The FICG consortium of Cofely Fabricom, Iemants and CG, which was selected by Van Oord for the Gemini offshore wind project in the Netherlands, has finalized the construction of the two HV offshore substations and has shipped them to their final destination. 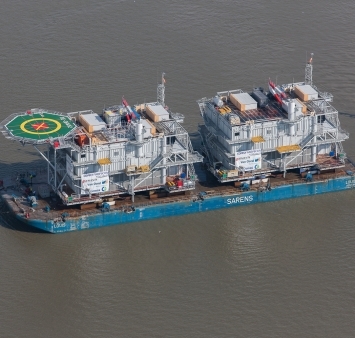 Both substations Buitengaats (300MW) and ZeeEnergie (300MW) left the Hoboken dock near Antwerp to begin their journey (estimated two to three days depending on the weather conditions) along the Scheldt towards the offshore park located 85 km north of the island Schiermonnikoog in the Netherlands. This journey is one of the last major steps before the final installation at sea. The Gemini project, which should be operational in 2017, is one of the largest offshore wind projects in the world. It is constructed further from land than any other wind farm (85 km off the Dutch coast). When it is complete, the park will have a total power capacity of 600 MW and will supply 785,000 households with green electricity, which reduces CO2-emissions with 1,250,000 tons. The Gemini project builds on the FICG consortium’s successful track record. 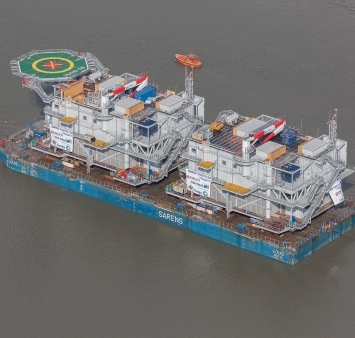 This is the sixth offshore project the consortium has shipped since the first collaboration in 2009. Other offshore wind projects finalized by the consortium are Belwind, Butendiek, Amrumbank, Luchterduinen and Humber Gateway.